Recent research has sought to examine the relationship between exercise and sleep. Are there more benefits to exercising in the morning compared to the afternoon or night? Studies are identifying the morning as the optimal time to exercise. Not a morning person? There are several simple tricks and hacks to help increase morning productivity. Maximizing the early morning hours can lead to improved mood, motivation, and better sleep. Establishing a morning routine is an excellent way to get the most productivity out of your day. Furthermore, incorporating a workout into your morning routine has lasting benefits throughout the day and can improve sleep. Morning physical activity is supported by current literature as beneficial for overall sleep health. In a study conducted in 2017, researchers found that under laboratory conditions, morning exercise enhanced the parasympathetic activity of the nervous system, as indicated by heart rate variability. On the other hand, evening exercise increased heart rate the following night and delayed the circadian rhythm by about one hour. A study using national survey data found that morning exercisers reported the best sleep health overall. Researchers found that just one bout of moderate-intensity aerobic exercise in the morning (7 AM) resulted in the most beneficial responses in blood pressure and improved overall sleep quality compared to exercise in the afternoon (1 PM) or evening (7 PM). Sleep accounts for nearly one-third of daily activity. Shortened sleep duration is linked to obesity, type 2 diabetes, hypertension, and cardiovascular disease. Too much sleep has been linked to poor health outcomes as well. For example, longer sleep duration is associated with higher rates of health concerns such as inflammation, CVD, and depression. Therefore, either extreme of sleep duration (short or long) associates with a higher risk for various health outcomes. Other health concerns, such as depression, may have independent effects on both sleep and health. These factors introduce complex, reciprocal, and interacting relationships between sleep and various health outcomes. Those with sleep problems might consider getting their outdoor time and light exposure during the morning. This is consistent with recommendations for bright light therapy. Morning exercisers might also have more consistent daily routines, which have been linked to fewer self-reported sleep problems and better functioning circadian systems. With that being said, you may want to consider improving your morning routine to maximize your overall health and get the best night’s sleep. There are simple habits you can start practicing before bedtime and upon waking to increase morning productivity and set the tone for a successful day. Never underestimate the power of a good night’s sleep! Getting enough sleep is crucial for optimal health and makes starting your next day so much easier. Aim to get 7-9 hours of sleep each night. Establishing a bedtime routine such as limiting screen time, drinking a relaxing, caffeine-free tea, or reading a book are a few great ways to help your body prepare for rest. Setting out your work or gym outfit the night before also helps save time in the morning and will motivate you to get moving upon waking! Try making a to-do list for the next day. Or, simply set a daily goal and leaving it somewhere visible where you will see it in the morning. Checking items off your to-do or goal list produces a great feeling of accomplishment and can lead to increased productivity throughout your day. Before making your way straight to the coffee pot, try to drink a glass of water immediately upon waking. Imagine how you would feel if you went 7 to 8 hours without drinking anything. That’s exactly what happens overnight! Drinking water first thing when you wake up helps rehydrate the body, and promotes digestive and metabolic health. It even benefits skin health! Eating a well-balanced breakfast soon after waking will provide you with energy to get through your morning and provides a lasting feeling of fullness. Not only that, it will improve metabolism efficiency. Making your bed first thing when you wake up is an excellent habit to get into as it will set the tone for the rest of your morning. Getting a good night’s rest, hydrating and eating a well-rounded breakfast, making your bed, and setting out clothes the night before are just a few ways to maximize your early morning hours and help you stay motivated throughout your day. Get moving in the morning with CORE! 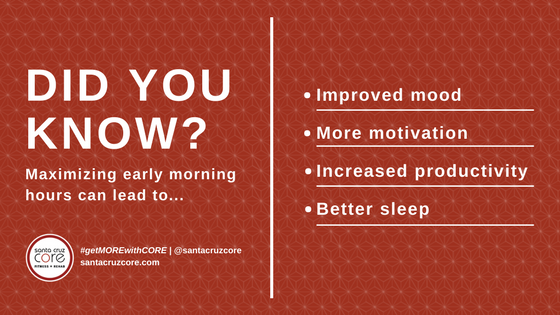 Santa Cruz CORE offers private and group training in the morning, afternoon, and evening! No matter when or what your workout routine, CORE is here to help you make the best of it. DOWNLOAD THE NEW SANTA CRUZ CORE APP + BOOK = FREE MASSAGE! This entry was posted in Featured, Fitness, Fitness, Health and Fitness, Recovery, Santa Cruz CORE, Sunrise / Sunset Photos, Surfers and tagged in ; city of santa cruz. branciforte, bedtime routine, jaimi jansen, morning motivation, morning routine, santa cruz core fitness + rehab, santa cruz core watsonville, sleep, sleep apneia, sleep issues. Bookmark the permalink.